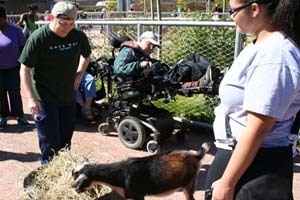 The Weekend & Evening Program (WE) offers a wide range of therapeutic activities and community participation opportunities for adults, 18 years and older, living with developmental disabilities. The activities are planned and organized to provide ongoing support, skill-building and social interactions. WE at Blossom Philadelphia offers a variety of fun things to do in a supportive environment, a place to develop relationships where everyone is treated with respect and a time to get together with friends. The program participants select from a program schedule based upon their individual preferences and interests. The schedule includes activities held on Friday evenings at Blossom Philadelphia’s center in Chestnut Hill and on Saturdays in community settings. WE at Blossom Philadelphia is a fee-based program where the program participant pays for the activities he or she is registered or confirmed to attend. All participants are responsible for their own transportation to and from events. Blossom Philadelphia does not provide transportation. Information regarding SEPTA’s CCT service is available from SEPTA at 215.580.7145 or on SEPTA’s website at http://www.septa.org/service/cct. at 215.248.7611 or lmelendez@blossomphila.org .